Paragon Rescue Kit Free Edition is a somewhat simple program which enables you to correct issues while booting your system. The application can come in handy under several different circumstances such as a virus attack, malware infections, corrupted system files and other reasons. 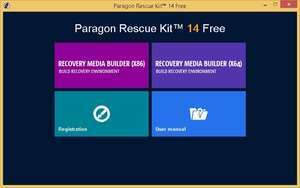 Paragon Rescue Kit Free can help you restore essential files. One tool which may be useful is the that which can recover deleted partitions. Version 14 is a freeware program which does not have restrictions and it's free so it doesn't cost anything. For security reasons, you should also check out the Rescue Kit Free Edition download at LO4D.com which includes virus and malware tests. Additional screenshots of this application download may be available, too. Rescue Kit Free has a presence on social networks. Rescue Kit Free download been highly rated by our users.